I had an eye-opening experience at a pig farm about five years ago. Since we usually buy a couple feeder pigs in the fall to utilize our garden scraps, I went to the hog farm to get a couple pigs. This was a small to moderately sized pig operation—but definitely a confined animal feeding operation (CAFO, aka “factory farm”). I wasn’t ignorant about the use of antibiotics in animal agriculture, but this was one of those days when reality struck. While I was there getting my two piglets, the delivery truck rolled up and unloaded a 4x4x4-foot pallet loaded with antibiotics—a month’s supply. Wow! Even if you know nothing about raising pigs, doesn’t common sense make you wonder how healthy the pigs are in the first place if that much antibiotic is needed? I haven’t been in a beef feedlot at the time of the antibiotic delivery, but it’s common knowledge that most feedlot beef cattle are fed low doses of antibiotics to keep them from getting sick on their totally un-natural diet of grains and poor living conditions. What are the health risks for human consumption of this meat? What’s the broad picture of animal health in a CAFO? How does this relate to health benefits of grass-finished beef? Here’s my take, based on a lot of reading and a lot of personal critical observation. 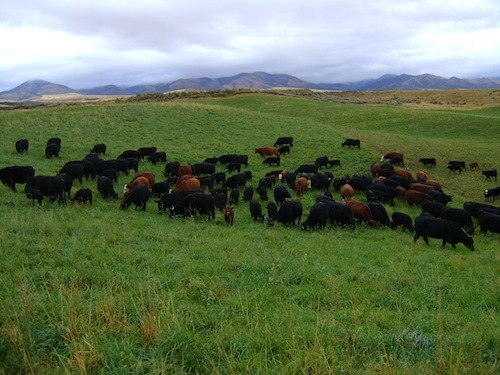 Here are six reasons why you should choose grass-finished beef. Many human bacterial diseases have become resistant to common antibiotics such as penicillin and streptomycin. Is it possible that the bacteria have mutated to be resistant to these drugs in the feedlot? 2. Do You Want Your Children Eating Growth Hormones? Feedlot animals are often fed growth hormones to make them gain weight and fatten faster. Is it possible that our children are entering puberty earlier than back in the old days? Think about the 5th and 6th graders you know. What do you think? High-grain diets cause serious changes in the digestive tract of ruminant animals, which leads to a change in the type of fat deposits in the tissue of the animal. For example: the fat found in an animal fed a diet high in grains will be high in pro-inflammatory omega-6 fatty acids (a fat most of us consume way too much of) while a grass-finished animal’s fat will be much higher in heart-healthy omega-3s—up to 60 percent higher in an animal that is primarily fed grass, according to nutrition guru Jonny Bowden. Case in point: one reason that wild fish is recommended so frequently is the fact that fish raised on a natural diet in their natural environment are high in omega 3s, like grass-finished cattle. Don’t mistake wild fish with farm-raised fish such as catfish, tilapia and trout that are fed a grain-based diet: those fish also are low in omega-3s and high in omega-6 fats—just like grain-fed cattle. For many people, a grass-fed steak is a treat to be savored on a rare (pun intended) special occasion. What kind of meat do you eat the rest of the time? If your regular diet consists of poor quality feedlot meats, you won’t see the long-term health benefits you desire just as surely as a one-mile jog won’t compensate for a week of sitting on the couch with chips and soda. Good health is a culmination of good daily choices. Choose all of your food wisely, and choose good food like grass-finished beef as part of a sensible diet; smart choices will greatly aid your quest for good health. By voting with our dollars to support the producers of healthy foods, we can make a difference up and down the food supply chain, and support a ripple effect that extends to our health. So here’s to your health! And by choosing pasture-raised and grass-fed meat sources, here’s to the health of our animals as well. Editor’s Note: Do you make a conscious choice to choose grass-finished meats and wild seafood when you shop and eat out? We’d love to hear your thoughts on the matter!